Sydney Roosters' desperate NRL season lurched into crisis mode on Monday as Canberra eased their way to a 38-12 victory at the Sydney Football Stadium. The defeat saw last year's beaten grand finalists sink to second-last on the ladder, with the improving Raiders moving above Parramatta and into 13th spot. They ran in seven tries to the Roosters' two, with Jarrod Croker finishing with a personal haul of 18 points. The struggling Roosters, who have now won just two of their last 11 games, got off to the worst possible start when Braith Anasta's opening kick-off went out on the full. From the subsequent penalty, the Raiders marched deep into the home side's half and young backrower Josh Papalii burrowed his way over for his third try in only his sixth NRL game. The Raiders then doubled their lead in the 11th minute when Joel Thompson did well to get the ball down, amongst a clutch of bodies, after Aidan Guerra and Jason Ryles had been penalised for holding down Brett White just in front of their line. But the Roosters responded well with their best spell of the game and reduced the deficit midway through the half when Todd Carney produced a perfectly-weighted chip-kick and Sam Perrett hauled in the ball and eased his way to the line. The Raiders stretched their advantage five minutes before halftime when Joe Picker ran over debutant fullback Mark Kheirallah to score after a great break from young fullback Nathan Massey. However, Carney had the final word of the opening stanza against his former club, linking well with Tinirau Arona, then taking the return pass to score. Blake Ferguson was the recipient of a lucky bounce six minutes into the second period when his hopeful kick and chase, wrong-footed Anasta and bobbled over his head allowing the former Cronulla man to regather and score to stretch the visitors' lead. Despite Carney showing flashes of the form that won him the Dally M Medal last year, the setback appeared to rock the home side's confidence and the Raiders took advantage after the interval, looking the more inventive side in attack. Croker added a fifth try for the Raiders on the hour-mark after the impressive Sam Williams spread the ball wide to the left wing, before the hard-working Shaun Fensom darted over for his third of the year. And with six minutes remaining Croker went over for his second, rolling his way to the line with remarkable ease and then added his fifth goal of the evening as many of the 9,817 crowd streamed out of the stadium. One downside for the Raiders was a suspected torn bicep tendon for NSW prop Tom Learoyd-Lahrs. If the injury is confirmed, it is likely to keep the Test forward out for the remainder of the season. Raiders coach David Furner was pleased with the performance but fell short of claiming their season had turned around. He also accused the Roosters of trying to spoil the game, by slowing down his side's giant forward pack and said he would be discussing incidents in the game with referees boss Bill Harrigan. "I think there were two teams out there, one came to play footy and one came to spoil a bit ... I was proud of how my players reacted," Furner said. "By no means are we out of the position we are in, but it has been two weeks of good footy and that has been pleasing after a couple of close recent losses." Despite having eight players from the side that started last year's grand final in this team, Smith claimed a lack of experience was the reason for his side's poor run of form. The Roosters have not scored more than 13 points in a game since round four and Smith said many of his players were still learning about how to play first-grade football. "I thought we put up a good fight, certainly in the first half, but a couple of our younger guys they don't even know how hard it is to hold onto the ball when they get smashed," Smith said. "... I think anyone who can't see what our problems are not having a go. "We have six or seven guys out there who are not capable of playing 80 minutes out there together. "The rest of the senior guys are playing at putting humpty dumpty back together again. "They then finish up making errors because they are fatigued from holding it all together. "I don't see it as anything technical at the moment - that group of guys prepared as well as any team I have seen." Canberra forward Tom Learoyd-Lahrs admits his NRL season is likely to be over after a sustaining a suspected torn bicep tendon in Monday's win over the Sydney Roosters. The Raiders ran out 38-12 winners at the Sydney Football Stadium, but the NSW and Australia star failed to finish the game after sustaining the injury in the second half. "I just came out to make a tackle on one of the boys there and I sort of missed him with my shoulder and stuck my arm out and hit him with my forearm and hyperextended my elbow," Learoyd-Lahrs said. "I think that just tore the tendon on the bicep, so it's not looking good." Learoyd-Lahrs has battled a series of injuries this season before returning to action last month, which cost him a likely spot in the NSW State of Origin team, and although he is hoping for the best, he is fearing the worst. "Hopefully it's not that (torn tendon) but that said, more than likely that's what it is," he said. "I'll just keep my fingers crossed but there's not much chance of it being (good news), because if it is torn I'm definitely gone. "I've been highly motivated the last couple of weeks, the last month I've probably been as motivated as I've ever been and really enjoying my football. "So this is a real blow, I'm pretty disappointed at the moment and I suppose it'll be worse tomorrow morning when I wake up and it sinks in. "If I do get the news that it is season-ending, I probably won't be the nicest person in the world to be around." Canberra Raiders prop Tom Learoyd-Lahrs has been ruled out for the remainder of the season after rupturing a biceps muscle in monday night's 38-12 win over Sydney Roosters. Learoyd-Lahrs tore the muscle off the bone in a tackle in the 70th minute at Sydney Football Stadium. The 26-year-old will undergo surgery as soon as possible. Canberra smashed a hapless Roosters outfit 38-12 on Monday night, overcoming a 12-match losing streak against the tri-colours at the Sydney Football Stadium that stretched back 16 years. The Raiders had not beaten the Roosters at the SFS since round 13 of 1995 but it turned out to be a case of lucky 13 as the Green Machine ran in seven tries to two in their second-highest scoring effort of 2011. Jarrod Croker had 18 points of his own via two tries and five conversions, while Josh Papalii, Joel Thompson, Joe Picker, Blake Ferguson and Shaun Fensom all crossed for their own four-pointers. David Furner's Raiders used the two points to lift themselves out of the tie for last place on the ladder with five wins and 10 losses for the year, including four from their last six starts. Meanwhile the Roosters only have one club - Gold Coast - and a massive for-and-against difference between them and the wooden spoon, and their season is all but over after they came one win from the premiership just 10 months ago. But star five-eighth Todd Carney said he and his team-mates and indeed everyone at the club would refuse to lay down and call it a season. "I think the one thing about the Roosters club is we all stick together and it was eight from 10 [losses] tonight ... it's nine now, so I'm not going to surrender and I know that the whole club's not going to do the same," he told Grandstand. "We're going to fight and we're going to finish the season in pride like any Roosters team would, and if it means working for next year that's what it's going to be." From the subsequent penalty, the Raiders marched deep into the home side's half and young backrower Papalii burrowed his way over for his third try in only his sixth NRL game. "We were playing a fair bit of footy for [Papalii]; he's been outstanding for us," Raiders skipper Alan Tongue said. "It's through just controlling the footy and being patient, and that's coming. You learn from a lot of the other good sides in the competition and we just need to do that because it makes a big difference." The Raiders then doubled their lead in the 11th minute when Thompson did well to get the ball down, amongst a clutch of bodies, after Aidan Guerra and Jason Ryles had been penalised for holding down Brett White just in front of their line. But the Roosters responded well with their best spell of the game and reduced the deficit midway through the half when Carney produced a perfectly-weighted chip-kick and Sam Perrett hauled in the ball and eased his way to the line. The Raiders stretched their advantage five minutes before half-time when Picker ran over debutant full-back Mark Khierallah to score after a great break from young Canberra number one Nathan Massey. Ferguson was the recipient of a lucky bounce six minutes into the second period when his hopeful kick and chase, wrong-footed Anasta and bobbled over his head allowing the former Cronulla man to regather and score to stretch the visitors' lead. Croker added a fifth try for the Raiders on the hour-mark after the impressive Sam Williams spread the ball wide to the left wing, before the hard-working Fensom darted over for his third of the year. And with six minutes remaining Croker went over for his second, rolling his way to the line with remarkable ease and then added his fifth goal of the evening as many of the 9,817 in the crowd streamed out of the stadium. "[Backing up to win] was real important to us, we haven't done that well this year but once again the control from our young halves was really the highlight," Tongue said. "Once again we gave away a couple of soft penalties there, we let them out of their own end cheaply but I think all in all the discipline was good, the patience was good and it was a pretty niggly game of footy and we didn't get caught up in that so that's really pleasing." One downside for the Raiders was a suspected torn bicep tendon for New South Wales prop Tom Learoyd-Lahrs. Raiders in team of the week. Round 17! Sharks flyer Nathan Gardner impressed again against a lacklustre Rabbitohs side. 1. Nathan Gardner (Sharks) - Made a massive line break and ran for 190 metres in yet another impressive attacking display from fullback against the underwhelming Rabbitohs. 2. Dane Gagai (Broncos) - Scored twice, including a try-saving 90-metre intercept try, and made two line breaks and five tackle busts as the understrength Broncos took a handy win. 3. Colin Best (Sharks) - The veteran busted five attempted tackles, provided two offloads, didn't miss a tackle and scored his 99th career try in a strong all-round performance. 4. Jarrod Croker (Raiders) - Crossed for two tries, landed five conversions, and made nine tackle busts as he ran for 141 metres from his 14 carries against the Roosters. 5. Blake Ferguson (Raiders) - Scored a classy - if a little fortunate - chip-and-chase solo try down the right flank, and ate up 210 metres from 13 runs, including five tackle breaks. 6. Ryan Stigg (Knights) - The stand-in Knights halfback impressed incoming coach Wayne Bennet with a classy display against the Dragons, laying on one try with a terrific cut-out pass and scoring the match-winner himself. 7. Luke Walsh (Panthers) - Set up Penrith's opening try with a perfectly executed chip-and-chase, created the other two a pair of bombs for Burns, and helped win the territory battle over the Bulldogs with a whopping 523 kick metres. 8. Josh Papalii (Raiders) - Yet another barnstorming prop in Canberra's heavyweight pack, Papalii continued his great recent form with 16 hit-ups for 141 metres, including six tackle breaks and a try. He did come up with a couple of errors and three missed tackles, but his impact in the middle helped to tear the Roosters to shreds. 9. Andrew McCullough (Broncos) - Returned to Brisbane's starting side and impressed with a dozen darts from dummy-half, 42 tackles and a try assist. 10. Luke Douglas (Sharks) - Crashed over for the opening four-pointer against the woeful Bunnies and led the Cronulla pack in the absence of Paul Gallen and Kade Snowden with 18 hit-ups for 129 metres. 11. Matt Gillett (Broncos) - Did it all himself to score the match-winner after a strong all-round performance against the Eels in Parramatta. 12. Nathan Hindmarsh (Eels) - Playing in a losing side that lacked attacking spark, Hindmarsh at least ensured the Eels got the hard yards done by leading his forward pack in both hit-ups (16) and tackles (57). 13. Travis Burns (Panthers) - Had a good night in attack and defence, scoring two tries, slotting four goals, and leading his team with 39 tackles. 2 entries - Darius Boyd, Anthony Minichiello, Nathan Garnder, Luke Burt, Jharal Yow Yeh, Jamal Idris, Greg Inglis, Blake Ayshford, Ben Pomeroy, Steve Matai, Jamie Lyon, Kieran Foran, Daly Cherry-Evans, Luke Bailey, Dan Hunt, Fuifui Moimoi, Josh Papalii, Ben Creagh, Frank Pritchard, Anthony Watmough, Dallas Johnson, Sika Manu, Chris Heighington, Alex Glenn, Tariq Sims. The Canberra Raiders have broken their Sydney Football Stadium hoodoo. They've thumped the Roosters 38-12 in their NRL match - their first victory over the Sydney-siders at the SFS in 16 years. The Raiders' seven tries to two victory lifts them to 13th on the NRL ladder, while the Roosters drop to second to last. The Roosters have slumped to their 9th defeat in their last 11 NRL games. We can seriously go on from this and make the finals now. They played great! It has been far too long since we flogged someone, it was very enjoyable. SYDNEY - Sydney Roosters' desperate NRL season lurched into crisis mode on Monday as Canberra eased their way to a 38-12 victory at the Sydney Football Stadium. 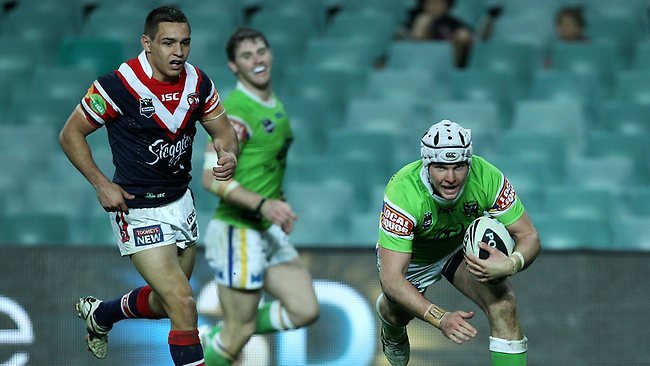 ...Sydney Roosters’ disastrous season took another downward turn with a humiliating 38-12 home defeat to Canberra. Josh Papalii, Joel Thompson and Joe Picker all crossed for the Raiders during a dominant opening half. Blake Ferguson crossed just six minutes into the opening half with Sean Fensome also crossing between a brace from Jarrod Croker. THE way Brian Smith tells the story, the Sydney Roosters are a little bit like Humpty Dumpty. If that's accurate, then they well and truly fell off the wall for good against Canberra at the SFS. In a season of low points for last year's grand finalists, the Roosters have now officially hit rock bottom. It was their worst loss of the season so far and came at a time when they needed to turn in one of their best performances to keep their fading finals hopes alive. The loss will only intensify the speculation surrounding Smith's position, with the veteran coach fighting off reports that all is not well at Bondi Junction and he has lost the support of several key players, including Dally M winner Todd Carney and Gold Coast-bound Nate Myles. Myles, along with fellow State of Origin representatives Mitchell Pearce and Anthony Minichiello, was not on hand to face the Raiders, but that was hardly an excuse given other clubs have been without more players this round and they have turned in more committed performances. Smith also pointed to the fact the club has a burgeoning injury list that includes forwards Frank-Paul Nuuausala, Martin Kennedy and Mitchell Aubusson. But there was more than enough experience out there, with nine of the 17 players involved in last year's decider. "We have got somewhere between six or seven guys there in our team tonight who at this stage of their careers are not capable of playing 80 minutes together," Smith said. "And then the rest of our experienced guys are trying to hold Humpty Dumpty together all the time and they finish up making mistakes and errors because they are fatigued." What must be worrying for Smith is the fact one of the most potent attacks in the NRL has lost its lustre. You have to go back to their round four 24-6 win over Wests Tigers in April to find the last time they scored more than 13 points in a match this season. That statistic didn't get any better against Canberra. Save for Carney - who set up both of the Roosters tries and finished off the second one himself - the Roosters never looked like getting over the white stripe for any more than 12 points. It was especially disappointing considering Smith had taken his troops to the NSW Central Coast in the lead-up to try to get them to bond together and end an awful form slump, which has seen the side drop nine of its last 11 matches. "There are a lot of shattered young fellas in there at the moment - there will be some guys sleeping about six inches into the mattress tonight," Smith said. "I'm not sure the coach will be sleeping quite as soundly as that. (But) that group of guys that played tonight prepared as well as any team I've seen. They were absolutely outstanding in the way they bonded together and tried to get the best out of each other." There was even worse to come for the Roosters, with the Raiders accusing them of spoiling tactics after the game. That being the case, they were still far too strong for their opponents, with the only sour note being a bicep injury to Tom Learoyd-Lahrs. "I thought there were obviously two teams out there, but one team came to play footy and one team came to spoil a bit," Raiders coach David Furner said. Sydney Roosters 12 (T Carney S Perrett tries T Carney 2 goals) at Sydney Football Stadium. Referees: Matt Cecchin, Henry Perenara. Crowd: 9817.